After carving a name for itself in top quality cladding products, it was only natural for Tiger Profiles to include project management into its job profile. This will ensure efficiency in project delivery. Leading UAE-based roof and cladding company Tiger Profiles is expanding its services to include project management, supervision and installation of its T-seam cladding systems to optimise efficiency in project delivery. The company, a one-stop-solution provider for specialised metal roofing and cladding products and systems, says its team of seasoned experts and professionals ensures that the projects are handled in such a way as to deliver value for money and cost efficiency to clients. Tiger Profiles’s product range includes premium roof, wall and floor deck profiles, insulated roof and wall cladding, concealed fix insulated wall panels, cold store panels, insulated internal partition panels, cold-formed profiles and sections, Tiger Engineered Building Systems (TEBs) and T-Seam standing seam systems. The company says that these products –which are backed by efficient service – meet clients’ requirements for design flexibility, engineering support, outstanding thermal insulation, acoustic, fire and environmental performance, premium product and service quality, cost efficiency, high-speed production and delivery and exceptional added value. The TEB is one of the latest products added to Tiger Profiles’s portfolio. “Far superior to conventional pre-engineered building systems (PEBs) in dimensional flexibility, design ability, production capability and cost efficiency, our TEBs are an ideal solution for protecting investments and assets in a range of industries, including agriculture, farming, manufacturing, commercial, industrial and warehousing,” says Bernard Nasr, the CEO of Tiger Profiles. The TEBs are manufactured from cold-formed, galvanised high-tensile steel sections which are more cost-effective, faster to construct and much more energy-efficient than equivalent hot-rolled portal frame buildings, he claims. Meanwhile, Tiger Profiles’ T-Seam system – its key brand of standing seam solution – caters to highly complex projects. “T-Seam, which comes with international approvals, is the ideal solution for projects where design flexibility, superior performance and outstanding durability are key,” Nasr points out. T-Seam profiles are roll-formed in the factory or on site in lengths exceeding 100 m in a single panel, and which are easily fixed to the structure. Since there is no need for penetration of the sheets, it eliminates the risk of water leakage and rust, he says. Ideal for use on new buildings as well as retrofit applications, standing T-Seam profiles are available in various widths and heights to accommodate almost any project’s geometry. In most instances, T-Seam panels are roll formed on site by a portable T-Seam manufacturing machine, thereby reducing the risk of panel damage during shipping, and ensuring full length coverage without end laps. Other key products offered by Tiger Profiles include preinsulated ventilation duct boards and accessories. The duct boards are produced in a range of dimensions using hi-index PIR (polyisocyanurate) foam insulation. The company says that to complement its range, it has collaborated with a renowned Australian manufacturer of state-of-the-art accessories and technologies to provide a comprehensive range of components for ventilation systems. Tiger Profiles also manufactures metal partition frames and insulated internal partitions and ceilings. The metal stud partition sections are lightweight, non-load bearing and quickly assembled on site, Nasr says. These low-cost partitions are suitable for all types of buildings, and erection can be carried out by one man, he adds. The company’s tongue-and-groove panels – also known as ceiling and internal wall partition panels – can be used as internal partitioning for industrial, commercial, retail, and residential buildings; and cladding in applications such as portable buildings. These panels are available in both foam and mineral wool insulation cores. Tiger Profiles is currently supplying its products and systems to some of the region’s newest airport projects. These include the Muscat and Salalah mega cargo terminals; Phase Three expansion of Dubai International Airport cargo terminal; Dubai International Airport Terminal One upgrade; and the Executive Jet Terminal at Al Maktoum International Airport at Dubai World Central (DWC). It has played a key role in the relocation of the Dubai Airshow to DWC, the Emirates Engines maintenance centres, and the Abu Dhabi Airport’s transfer baggage handling facility in Terminal 2. Its ongoing commercial projects include the expansion of the Mall of the Emirates as well as the Dubai World Trade Centre halls. Tiger Profiles, says Nasr, is now the roof and cladding partner of choice for a diverse range contractors and consultants in the region. This has been possible thanks to two decades of developing, enhancing and perfecting the combination of roofing, cladding and building solutions that are key elements of its product portfolio, he adds. 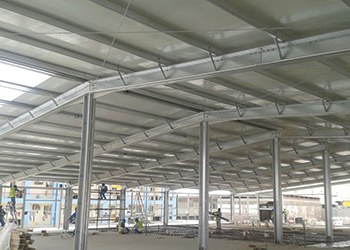 The company, which in 1993 began with mainly single-skin profiles and purlins in one workshop, and manual production of cold store panels in another, today has two large factories in Sharjah and Abu Dhabi for cladding and building systems which have placed it at the top of the supply pyramid, covering all requirements of industries in need of metal roofing, cladding and building systems, he concludes.